Baseball season is finally here and what better way to launch the start to America’s favorite past-time than by bringing a taste of the ballpark into your home! I usually shy away from recipes that involve yeast and/or dough that has to double in size, as I’ve had my fair share of flour-flinging failures in the pizza dough department. But Alton Brown has done it once again, proving that making bread is actually not impossible. Stick to the detailed recipe and you’ll have trays of hot doughy pretzels in less than two hours. 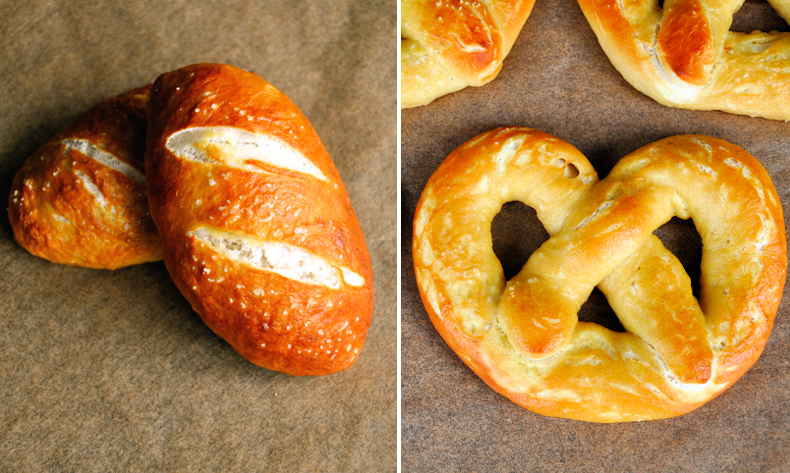 I experimented with shapes, forming some of the dough into mini pretzel baguettes. I find they’re better for dipping and topping with warm cheese, tangy mustard, or my favorite, melted butter and a sprinkle of cinnamon and sugar. In the bowl of a stand mixer, combine the water, sugar and kosher salt. Sprinkle the yeast on top and allow it to sit for 5 minutes or until it begins to foam. Using the hook attachment for the mixer, add the flour and butter to the bowl and mix on low until combined. Remove the dough from the bowl. Clean the bowl and then oil it well with vegetable oil. Line two sheet trays with parchment paper and then lightly oil them. Bring 10 cups of water and the baking soda to a rolling boil in an 8-quart saucepan. While the water comes to a boil, turn the dough onto a lightly oiled work surface and divide it into 8 equal pieces. Roll out each piece of dough into a 24-inch rope. 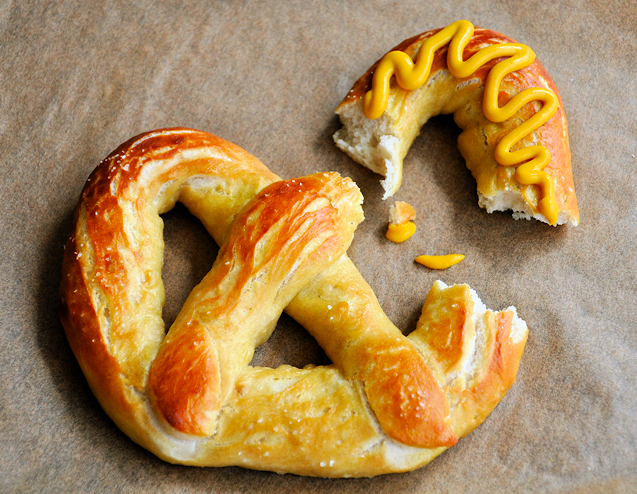 Shape the ropes into pretzels then return them to the cookie sheet. You can also optionally form the dough into rolls at this point. Place the pretzels, one by one, into the boiling water for 30 seconds. Remove each of them from the water using a large slotted spoon and return them to the cookie sheet. Brush the tops with the egg wash and sprinkle with kosher salt. Bake until golden brown in color, 12 to 14 minutes, then let cool for 5 minutes before serving.